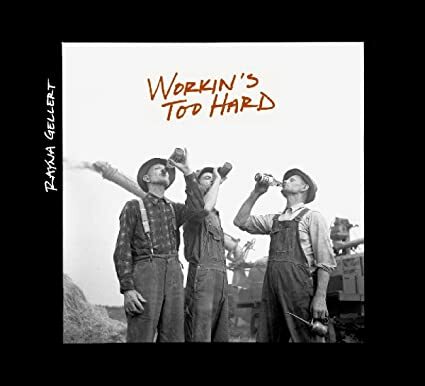 Rayna Gellert's Workin's Too Hard is a little long to be an EP and shorter than an album, but it says a lot more than most. Gellert is perhaps best known for her work in the roots band Uncle Earl. I don't know too much about this corner of Americana, though, and the seven songs on Workin's Too Hard is enough keep Gellert on my radar. The album was recorded in a single room with, according to the photo on the inside jacket, with the musicians just inches from each other. This intimacy can be felt throughout the songs. While most of them are slow-paced, the uptempo "I'm Bound for the Promised Land" allows the band to let loose a bunch of energy. However, it's in the first six tracks that they truly spread out and shine. From the get-go with "Workin's Too Hard," Gellert's all-too-human narrators fill us with empathy and warmth, even as we immerse ourselves in their pain. These songs feel timeless but are truly distinctive. It's a beautiful compilation and I'm excited to go deeper into Gellert's catalog. Speaking of the jacket, if you're into this kind of thing, the design on the physical album is beautiful. From the understated style of the jacket to the dirty fingerprints on the CD itself, the same amount of care and craftsmanship that went into the music can be found in the album. The whole project is intimate, earthy, and human -- things we all need in the coming years.